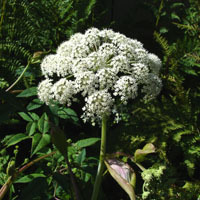 Kneeling angelica is a large perennial with large dome shaped flower. Use it along a pond, or steam for an attractive landing pad and nectar source for butterflies. Kneeling angelica's leaves have an interesting angled joint on the leaf stalks.